Sprouters supply you with fresh and nutritious bean sprouts all year round. Sprouting beans is easy. Grow your own sprouts so that you have a cheap, healthy and available food source right on your kitchen bench. Sprouts will grow at any time of year and are an easy way to turn yourself into a vegetable gardener! Sprouts are cheap, simple, nutritious, and would you believe it, delicious. Even if you don’t like sprouts you can throw them in a smoothie and blend them up with some ripe fruit to get all the health benefits the easy way. 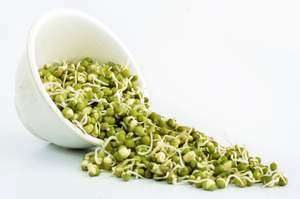 Sprouts are a high protein, enzyme-rich food that boosts immunity, growth and strength. They’re good detox food as sprouts are high in antioxidants to drain the toxins from our bodies. Sprouts are also a great weight loss food - they’re filling but low in fat and calories. Did you know you can buy sprouting lids for less than $5? Before you rush out and buy a high-tech sprouting kit, the easiest thing is to just buy a sprouting jar lid that will fit most canning jars. If you can’t find one at your local health food shop you can buy them online. A sprouting lid is simply a plastic lid with holes in it. The advantages are they’re easier to clean and drain better than a lid you’ve poked holes in yourself, and there are more holes there for more thorough draining. Don’t forget you can still make your own sprouting jar... just make sure that you rinse and drain your sprouts reailly well at least 3 times a day. The Easysprout sprouter is a smarter than average jar sprouter - it uses convection to circulate himidity between its inner and outer jars and has a snap on vented lid that makes it suitable for travelling. Even using the jar method you can sprout a variety of seeds at once. Health food stores sell stir-fry and salad mixes – they’re more expensive than buying sprouts individually but make producing a variety of sprouts easy. If you’re just beginning to experiment with growing your own sprouts it might be a good idea to start simple with a sprouting lid or jar. It will take a bit more effort from you but you can test if you like sprouting before you invest in a multi-tiered system! Having said that, after you’ve been sprouting a while the jar method wears a bit thin - especially if your whole family eats sprouts. We’ve been through the “one jar at a time” method, and even though sprouts only take 3-4 days to be ready to eat, we’d always finished our supply before the new lot were sprouted. I tried bigger jars but the sprouts didn’t rinse and drain properly (well, to be more correct I didn’t rinse and drain the sprouts properly, I’m always in a rush) and ended up going mouldy. This is when it’s a good idea to move on to a tray design sprouter. Hemp sprouting bags are another easy option for beginner sprouters. They're cheap and easy to use. Made from chemical-free, untreated hemp they are naturally resistant to mould and mildew so they can be re-used for years. Just place your sprouting beans in the bag, dip in water and hang. When you want more volume and varieties of bean sprouts, along with easier and more thorough rinsing, move on to a tray sprouter. If you’re buying a sprouter as a gift, I’d recommend you buy a tray sprouter rather than a jar sprouter. Some tray sprouters even come with semi-automatic rinsing using siphons and pumps, you just have to fill the reservoir once a day and your sprouts never dry out. I still don’t mind doing the rinsing myself so a simple sprouter with 3 trays is ideal for us. I don’t need a built in sprinkler system for my sprouter (I’d be worried about wasting electricity anyway) I just need the sprouts to be spread out more so they get enough air and fresh water to not go claggy. Using trays makes it easier to grow a variety of sprouts, and stagger when you start each trayload so that you have a constant fresh supply. Me and the kids also get a kick out of watching the sprouts grow, so transparent sprouters like the Kitchen Crop sprouter are ideal for us. The Kitchen Crop sprouter uses siphons to circulate water, you freshen water once a day, sprouter does the rest. Some reviewers comment that this sprouter is better for larger seeds though as smaller seeds can sit in the grooves and rot. Other reviewers comment that you simply have to tilt the sprouter when you’re using smaller seeds to make sure the water has drained properly. Tray sprouters are stackable, so you can grower larger amounts in a smaller space. Often you can buy extra expansion trays so you can stack your sprouter even higher. When you have the money to get fancy, the more expensive sprouters available come with self-rinsing, oxygenating and humidifying features. They are basically automatic sprouters. These will usually cost you over $100. The big advantage of these is they continuously circulate mist and oxygen around your sprouts, getting the balance just right so that they don’t dry out or get mouldy. They may be worth the investment if you’re seriously not home enough to rinse your own sprouts. The advantage of purchasing a basic sprouter kit and seed is it contains all you need without having to think about it. However, when I did the maths it was usually cheaper to buy the sprouter and seeds separately. It’s worth taking the extra 5 minutes to check your kit adds up to a saving, otherwise order the sprouter and seed separately. Some people add a tablespoon of vinegar to their rinsing water to prevent mould, then rinse again with clean water. If you’re having trouble with mould, try spreading out trays overnight then stacking again in the morning when you need the room. Many sprouters offer lifetime warranties, it’s worth watching out for. Check out these yummy sprout recipes. I love the sandwich spread recipe but I use any kind of sprout, not just alfalfa. If you’re taking the effort to sprout your own live, healthy, protein-rich food it makes sense to use organic seed. See how to sprout beans for more instructions on sprouting times for different seeds.